Most people don't know that for about 10 years I studied and performed close-up magic. In fact, it was my day job for a while — I even invented a few tricks! Why am I telling you this? Because, believe it or not, being a magician has informed my web design practice in a profound way. Let me tell you how. When a magician passes a coin impossibly from one hand to the other with a simple wave, the coin doesn't actually have to dematerialize and pass through thin air — it just needs to look like it does. And then I realized: I should use magic. I didn't need to write some custom Ajax that would preload the target page. I just needed to trigger an interaction that scales​ the body and moves two divs set off-canvas. 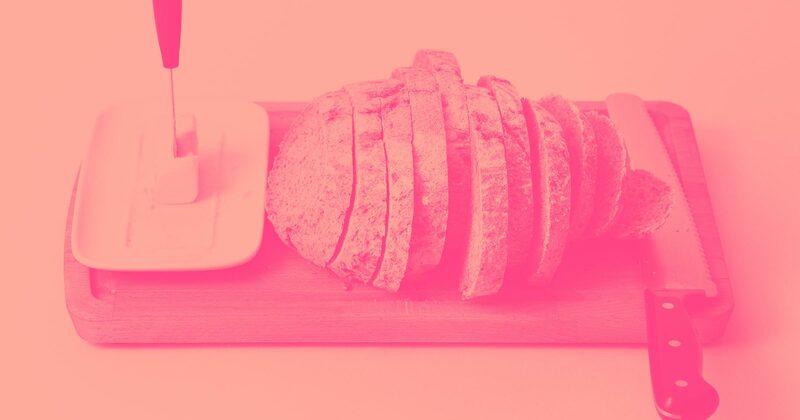 Webflow made this part easy with Interactions — all I needed to do was find a way to add a delay to the link that was clicked. Here’s what we’re going to build. 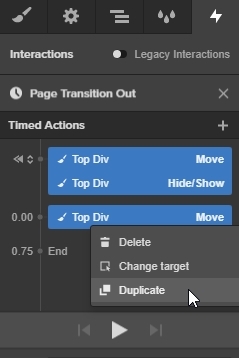 Copy the Top Div by right clicking and selecting duplicate from the flyout menu. These will be closing and opening page transition shutters. You’ll notice the shutters are really in the way. Do the same for the Bottom Div. Now that they’re out of the way, we can add the interactions and URLs. You’ll notice I replaced the URL with the “slug” of my destination page. You can find your slug by going to the page settings panel. 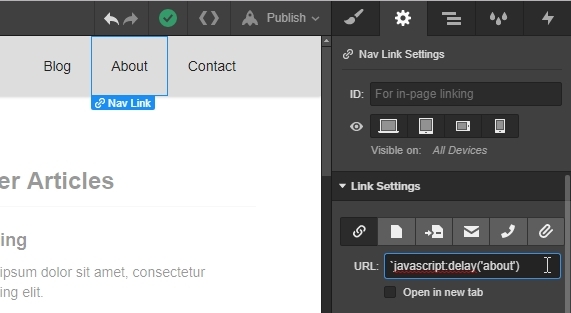 Follow the above process for each link that leads to another page within your project. Publish your project and test it out. 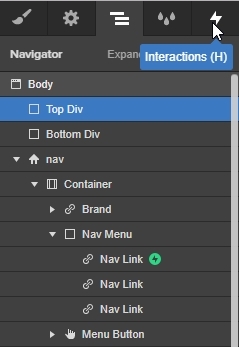 Select a link and open the Interactions panel. 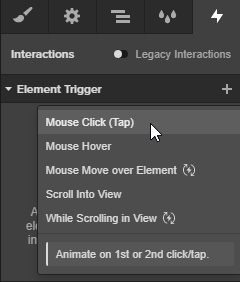 Add an interaction by clicking the plus icon next to Element Trigger and choose Mouse Click (Tap) from the dropdown. In the On 1st Click section, open the dropdown menu. And select Start an Animation. 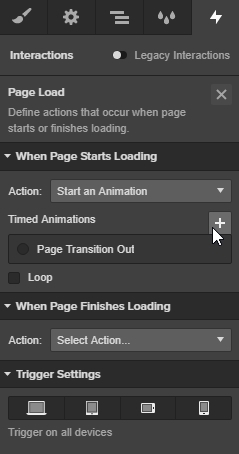 Click the plus icon in the Timed Animations section. Open the Navigator panel and select the Top Div. Return to the Interactions panel. 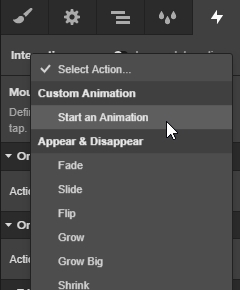 Click the plus icon next to timed actions and choose the Hide/Show option. Next, add a move transition by clicking the blue plus icon next to the previous hide/show interaction. Now, select all three interactions, highlight the top, and while holding shift, select the bottom interaction. Once they’re all are highlighted, right click any one of them, and select Duplicate from the flyout menu. You’ll now have three more interactions — again, highlight them all, right click any one, and choose Change Target from the flyout menu. 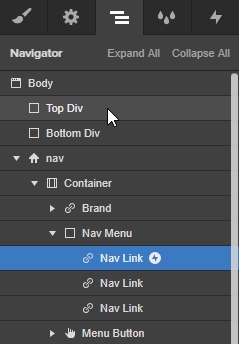 Now open the Navigator panel and select the Bottom Div. 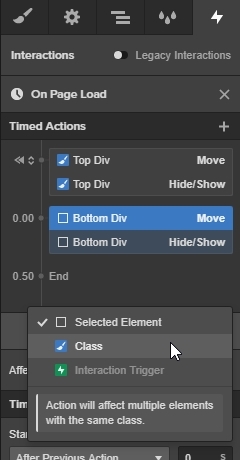 Return to the Interactions panel, highlight one of the newly targeted interactions, and change the affect setting to class. 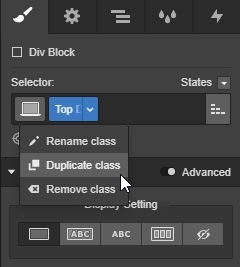 Make sure that the “All elements with this class” is also set. 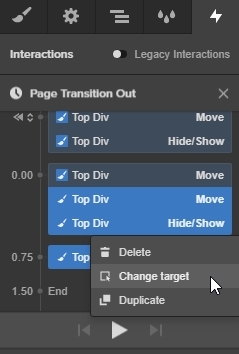 Highlight both the move and the hide/show for the Bottom Div and set the timing to "set as initial state." 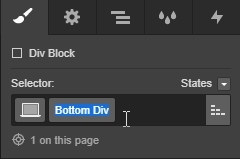 Next, click and drag the Bottom Div, bringing it up to its Top Div counterpart. Change the Y setting of initial state Move interaction to 50vh. Continue this process for all your buttons. As of right now we have a slick exiting interaction, but when the next page loads, it isn’t so pretty. Let’s fix this by adding an interaction on page load. 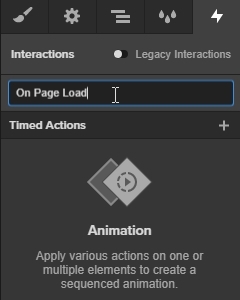 Open the Interactions panel, hit the plus icon next to the page trigger text, and from the dropdown menu select the page load option. 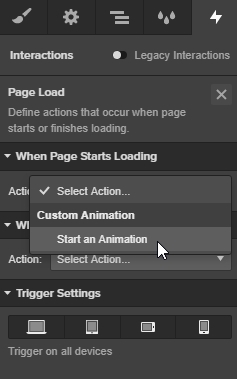 From the “When Page Starts Loading” section, select Start an Animation from the dropdown menu. From here you’ll see the interaction we previously created. We’re going to create a new one, so click the plus icon. 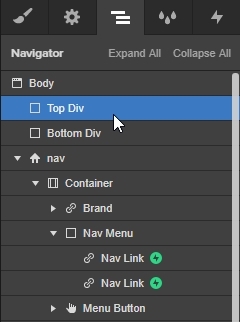 Now open the Navigator panel and select the Top Div. Return to the Interactions panel, click the plus icon, and add a Move interaction. 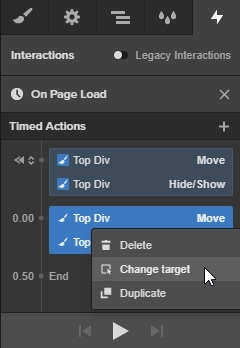 Add another interaction by clicking the plus icon next to the Top Div move interaction and select hide/show. 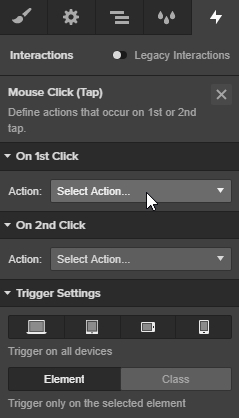 Highlight the two created interactions by pressing Control+click (on PC) or Command+click (on Mac). 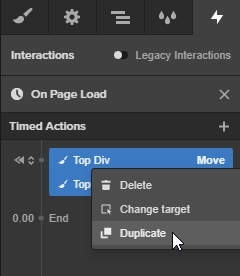 When both are selected, right click, and select duplicate from the flyout menu. Now, right-click the new interactions and change the target. 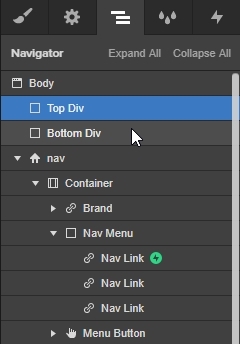 Open the Navigator panel and select the Bottom Div. 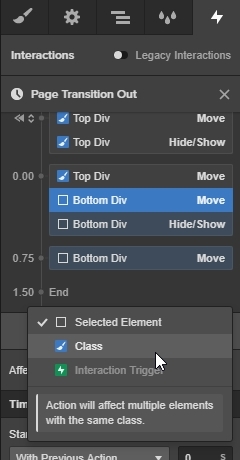 Return to the Interactions panel, select one of the Bottom Div interactions, and change it to affect all elements with this class. Again, highlight both Bottom Div interactions and click and drag them up to the Top Div interactions. 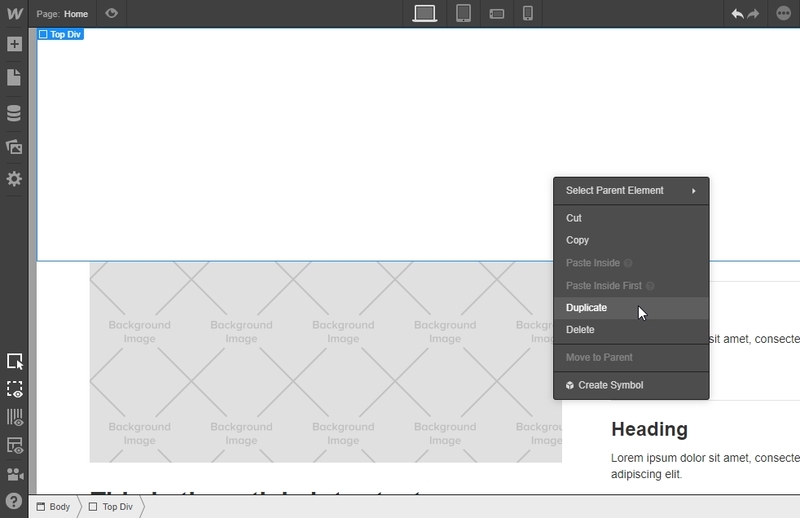 Now highlight the two Move interactions, right click, and select Duplicate from the flyout. 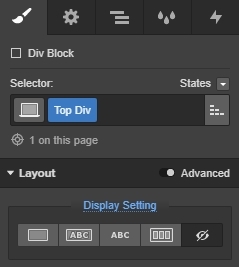 All that’s left to do is to make sure all your pages have the page load interaction and the Top Div and Bottom Div in place. 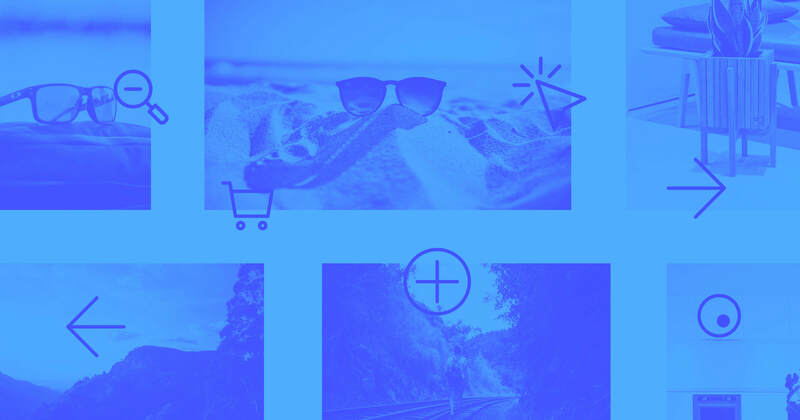 This is a pretty simple page transition effect — spend some time seeing what you can make happen between pages and please share them. I’d love to see what you make!